If Commissioner Gordon were to ever learn the secret identity of Batgirl he would be beyond shocked to find out it's his own daughter. That's right, young Barbara Gordon has decided to join Batman and Robin in their mission to keep Batman safe! Now Barbara being who she is didn't want to wear the black and gray that the dark knight wears, she wanted something more colorful. So when she goes out to bring villains to justice she does it in purple and yellow. 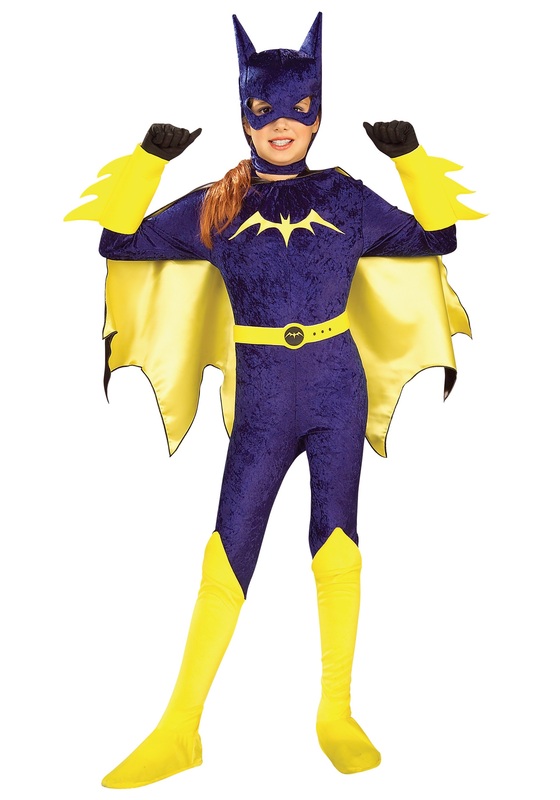 Let your girl play the role of Batgirl with this vibrant costume. With a retro inspired look, it will be the perfect costume to get her in on the superhero fun! This material rips and comes apart instantly. Within 5 minutes of trying this costume on, the costume needed extensive repairs. The color is not purple, it is blue. Find another batgirl costume! I'm sincerely sorry about the quality of the costume you received, but it looks like you reached out to customer service and we able to get this resolved for you. Loved this design, so I bought it, but it had very cheap material and ripped. So I bought a plastic mask, kept the arm gauntlets, belt, and cape and put on some leggings and a crop top. So buy it, if all you want is gauntlets, belt, and cape!